I have repaired a number of high current DC power supplies. Rather than replace all the main filter capacitors (expensive), I would like to test the output for the AC ripple voltage. I use a digital voltmeter and need to know if a DC blocking capacitor is needed, and its value. Also, what is an acceptable ripple level in millivolts? What causes a filter capacitor to fail isn't because its capacitance decreases, but rather because its ESR value increases. ESR acts like a resistor in series with a capacitor (hence the name Equivalent Series Resistance). It includes resistance of the dielectric, plate material, electrolytic solution, and terminal leads at a particular frequency. 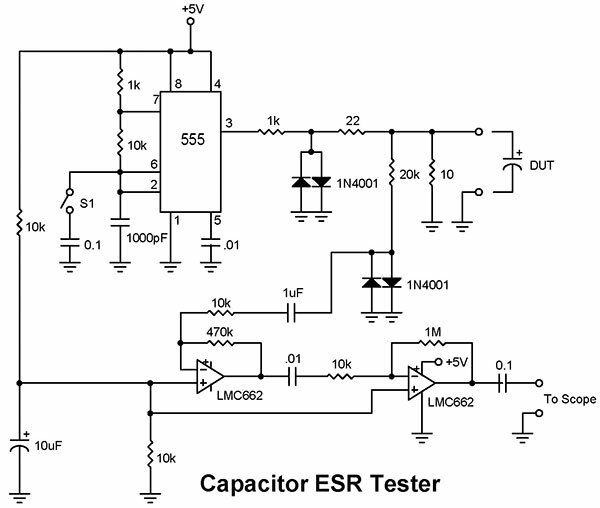 As a capacitor's ESR increases, so does the ripple voltage across the capacitor. A simple ESR tester is shown below. The heart of the tester is a 555 square wave oscillator running at about 100 kHz. The resistor values (1K and 10Ω) are selected to knock down the signal to 100 mV, which means you can use this unit as an in-circuit tester (turn off the power!). The diodes are inserted to protect the tester should you accidentally attach it to a charged capacitor. The op-amps are needed to bring the signal up to a level where it's readily displayed on any oscilloscope, even those with lesser sensitivity like a converted PC sound card oscilloscope. The instrument can be calibrated using a standard film resistor (non-inductive). At 100 kHz, ideal capacitors of 10 µF or greater appear as a short circuit to the AC test signal. Capacitors in the 0.1 to 10 µF range with an ESR of 2Ω or more will distort the square wave, causing its top to progressively tilt as the capacitance decreases. This is the result of the capacitor charging up as it integrates the test signal. A shorted capacitor will not integrate the signal. At the other end of the scale — capacitors of 10 µF and larger — it's virtually impossible to distinguish a low ESR capacitors from a shorted one. Don't forget that the ESR is frequency dependent, though. So as the frequency changes, so will the ESR. A shorted capacitor won't show this characteristic. For example, at 500 Hz (S1 closed), a 2200 µF cap will show the tilted effect displayed by a 3.3 µF cap at 100 kHz. An AC voltmeter can be substituted for the oscilloscope — with reservation. Most DMMs can't stretch to 100 kHz, and few can measure beyond 10 kHz. Fortunately, the problem is easily resolved using the circuit in "AC Millivoltmeter DMM Adapter" below.